Bophana is the name of a young Khmer woman who was a prisoner at S21, a former high school in Phnom Penh turned into a prison by the Khmer Rouge. Bophana continued to write letters to her fiancé, breaking the Khmer Rouge’s interdiction of love and private life. She died in prison at 25, after being tortured for more than five months. By adopting the name of Bophana, the Center is passing on the message of resistance, courage and dignity left for future generations by this woman through her letters and her heroic story. Bophana Center was launched, it was designated as the Bophana Audiovisual Resource Center. Co-founded by film director Rithy Panh, the Bophana Center collects film and sound materials related to Cambodia and gives the public free digital access to this unique heritage. 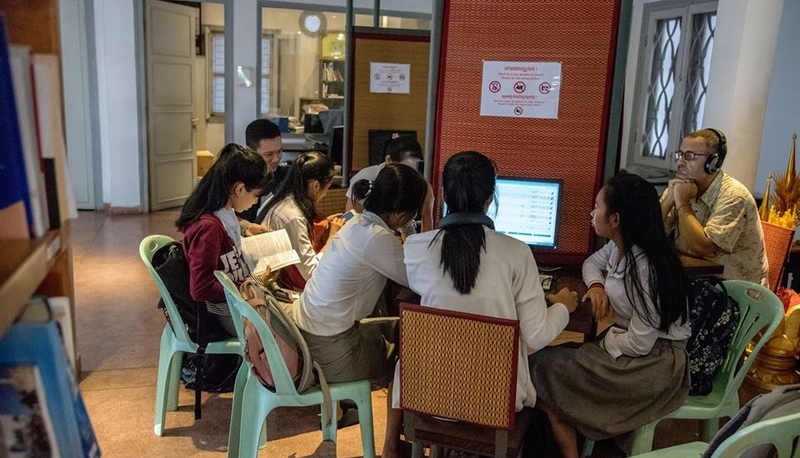 The large quality database attracts a diverse and wide audience, including Cambodian youth, teachers, students, scholars, tourists, and journalists. These archives are also brought to life through conferences, debates, exhibitions, and workshops organised by the Center. Bophana also trains young Cambodians in cinema, audiovisual creation and new media, inspiring meaningful productions about their own culture. A place of exchange and interaction, the Bophana Center also supports creation in all its forms by welcoming artists: they create the archives of tomorrow. Cambodia is Southeast Asia’s most homogeneous nation; up to 95% of the approximately 15 million people belong to the Khmer majority. Culturally, Cambodia remains highly patriarchal and hierarchical so that voices of dissent are still not accepted. The situation for women is particularly acute given that knowledge and information on gender and gender equality is still very weak. Cambodia ranked 105 out of 149 countries in the 2013 Gender Inequality Index. There is a high level of discrimination and violence against women in the domestic and public spheres. GBV against women and girls is a pervasive violence of human rights that persists in every country in the world and cuts across all socioeconomic groups. Many communities are indigenous due to geographical reasons. Different ethnic, social and complex political backgrounds make the situation even more complicated. Even within a well-connected society, indigenous communities still exist where people with disabilities experience violence, and indigenous women and girls are subject to abuse. And indigenous peoples are often exposed in social economic, cultural and political life. Challenges such as land dispossession, conflict, insecurity, displacement, low rates of birth registration, limited access to culturally appropriate education and health services, the lack of access to justice and other essential services, including social services. • To organise screenings with relevant stakeholders.